There are the vanilla butter creams, the chocolate swirls, and of course, Boston Cream. They sit in delicious rows beside Red Velvet, Italian Rum, and even Turtle-flavored cup cakes. Yes, cup cakes. With 60 flavors and different sizes to choose from, the Cup Cake Café at 297 Rantoul Street in Beverly, MA, has seen a steady following of, well, indulgence since it opened five years ago. “Now I dream cupcakes,” says owner and baker Monica Hatherley, who bought the bakery in 2004 when she was a real estate agent looking for a change. The bakery started out much like a coffee house, which sold a variety of baked goods. The move was risky for Hatherly, but it lead to the success of her business. She soon learned that if she made what she loved, business would pick up. It did. Phone orders starting coming and now those calls dictate what goes into the case each morning. But there are staples which customers can count on, like vanilla buttercreams or Boston Cream to name a few. New creations like the Snowball cupcake also sit proudly under the glass. Hatherly makes a certain number of cupcakes each day depending on specific orders and what she’s in the mood for. Once they’re gone, customers are out of luck. Friend and customer Val Kenney believes Hagerdly is successful because cupcakes make people happy. “Have you ever heard of anyone who was sad while eating a cupcake? I don’t think so,” said Kenney, who works on holidays and is paid in cupcakes. 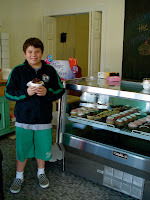 The Café was recently featured on the Phantom Gourmet cable television show and Hatherly saw a new wave of customers. That meant new publicity, something she admits she’s still getting used to. With no plans to hire more help or to start another store, she sometimes feels overwhelmed. 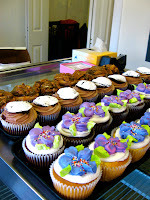 You and your friend and customer believes hagerdly is successful because cupcakes make people happy. have you ever heard of anyone you sad while eating a cupcake i don't think so works on holidays and is giving in cupcakes on market. its nice article thanks for sharing. الافضل شركات تنظيف بالرياض تقدم العديد من خدمات النظافة داخل مدينة الرياض من شركات تنظيف بجدة و تنظيف المنازل والبيوت بالرياض وايضا تنظيف المكاتب والشركات وتنظيف المساجد والموكيت والسجاد وكل هذة الخدمات تتم داخل المكان عن طريق فريق عمل بزي موحد لدية معدات التنظيف اليدوية التي لاغني عنها بالاضافة الي المعدات الحديثة من ( ماكينات تلميع السيراميك والبورسلان – تنظيف خزانات بالرياض – ماكينات غسيل المجالس والكنب – ماكينات شفط الغبار او المياه – ماكينات التنظيف بالبخار – ماكينات ضغط المياه و تظنيف الواجهات الحجر و الزجاج – ماكينات شفط المياه لسحب المياه عند تنظيف الخزانات او تنظيف المسابح . Thanks a lot for sharing best products. awesome website i have ever landed. Thanks for full support. I have to say that i am in love with the cup cakes. The staff at Cup Cake Cafe must be overjoyed, with the thought that for such a long time they have been doing a great job. Its a great achievement. Thank you for sharing. Searching for government jobs then, it's a great opportunity to find BSNL 2018 Recruitment for different posts.. It is s such a great job indeed to develop a small business and make it famous. These cupcakes look yummy and according to the writer, you are a great cook. I like the way you are dedicated since passion can make you do great things. Sometimes motivation can come from reading what people did in the past and succeeded. We offer research work through american history writing assistance which can help you do great. Contact us and success will be your all time expectations. I think that a cup cake hotel is one of the best business to begin with, its a great thing that you shared and gave many people the understanding of how a small business can be of help and also how it can bring forth expansion. With the most Affordable Research & Writing Help, many people have been able to study and find out which areas they are good at when it comes to small businesses. more so, this helps many people get to identify the market and what people need. Thanks for providing a very interesting post. thank you for the creator of this website because this is a site that gives very useful information to me so please cooperate to always provide useful information for everyone. That's a very good article, thanks for those of you who made websites that have this good article. FORDPOKER adalah Agen Dewa Poker yang menyediakan permaainan Domino QQ Online, Poker Online, bandar ceme dan Capsa Susun Terpercaya di Indonesia. Minimal Depo Sebesar Rp.20.000,- . TERIMA DEPOSIT MENGGUNAKAN PULSA. Menawarkan bonus referral 20% dan Bonus CashBack 0.3 yang berbeda dengan poker-poker lainnya dimana bonus yang kami tawarkan lebih menguntungkan bagi para referral yang teleh berusaha dengan giat untuk mendapatkan penghasialn melalui system referral poker online.